Since they began to capture large swathes of southern Somalia, radical Islamists have been undertaking a programme of destroying mosques and the graves of revered religious leaders from the Sufi branch of Islam. The destruction of non-approved religious sites started last year when they began to knock down an old colonial era church in the town of Kismayo. Most Somalis are Sufi Muslims, who do not share the strict Saudi Arabian-inspired Wahhabi interpretation of Islam with the hardline al-Shabab group. They embrace music, dancing and meditation and are appalled at the desecration of the graves. But al-Shabab sees things differently. The group's spokesman in the town of Kismayo, Sheikh Hassan Yaquub, told the BBC Somali Service that his movement considered that the memorials were being worshipped and that this was idolatry - banned by Islam. "The destruction of graves is not something new: we target graves that are overdecorated and ones used for misleading people. "We are not aiming at the sheikhs [religious leaders] and their standing in the society, but it is forbidden to make graves into shrines," Mr Yaquub said. Grave are being desecrated wherever al-Shabab is in control. The town of Brave is home to a number of minority groups. Among them are the Sufi Bravenese, a Bantu group who speak a language unique to their town called Chimbalazi, similar to Swahili. Many of the graves of their religious leaders have been attacked. Graveyard caretakers have been arrested and told not to go back to work. The disappointment and sadness of this community has reached beyond Somalia. "The people of Brave feel the desecrations of graves are actions against humanity," said Mohamed Sheikh, a Bravenese community leader in Manchester in the north-west of England. "The Islamists closed the mosques and said no-one could pray at the ones near graveyards - arguing that the prayers performed there could not be proper prayers and would amount to worshiping the graves themselves. "These people [he avoids mentioning al-Shabab by name] cannot teach us about Islam. Islam reached Brave and all the coastal areas when the religion arrived in East Africa 1,250 to 1,300 years ago. "The living person can at least defend himself, but the dead cannot. The spirits of the dead deserve respect. Even when we walk near graves we walk slowly, because while the bodies are dead, the spirit is not. Destroying graves is despicable." There is evidence that the anger is stirring the usually peaceful Sufis to take up arms and fight back against al-Shabab. Has al-Shabab made a strategic error in antagonising the Sufis? The umbrella group Ahlu Sunnah Wal Jama (Sufi Sects in Somalia) has condemned the actions of what they call the ideology of modern Wahhabism and the desecrations of graves. They see Wahhabism as foreign and ultimately un-Islamic. Wahhabism is a branch of Sunni Islam dominant in Saudi Arabia. It preaches a more literal interpretation of Islam and condemns innovations in Islam and rituals. It is at the opposite end of the spectrum of Islam to Sufism. "These radical groups shed Muslim blood every day and they dig out and desecrate our graves. They are funded from outside and their Wahhabi ideology is foreign and must be dealt with," says the group's spokesman Abdirasak Mohamed Al Ash'ari. The group has now joined forces with the embattled government of President Sheikh Sharif Sheikh Ahmed, a moderate Islamist, against al-Shabab. Ahlu Sunnah Wal Jama now controls much of the Galgadud Region in Central Somalia after they defeated al-Shabab in a number of battles. 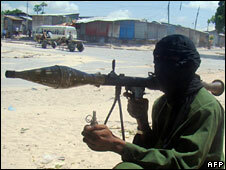 In one of their battles they managed to kill a senior al-Shabab leader. By antagonising the Sufi groups, al-Shabab may have gone too far.